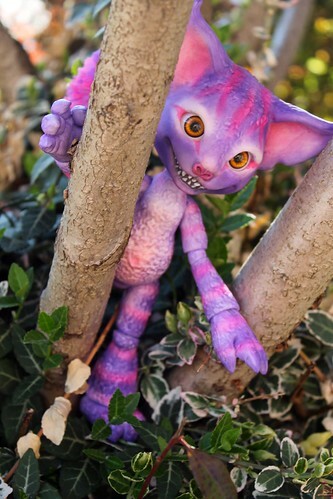 As some of you may know, I have a great love of all things Alice in Wonderland and I am especially fond of the Cheshire Cat. 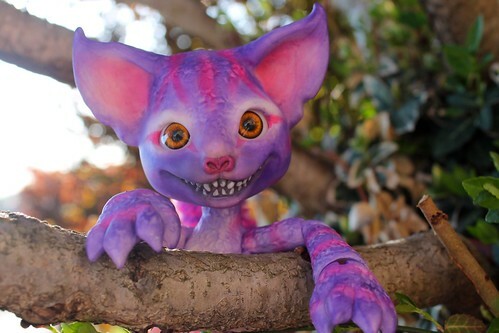 I forget exactly how I discovered Grin the Cheshire Cat bjd by MushroomPeddler but I saw him and absolutely loved him, unfortunately he was not available for sale at the time. 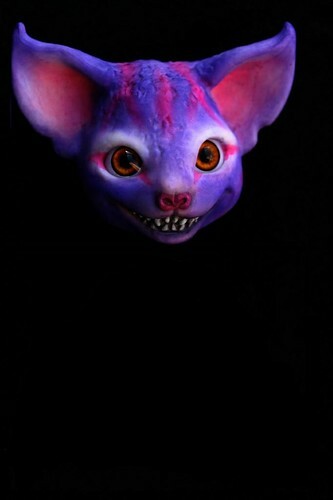 I happened to be browsing on etsy for various bjd stuff around Valentine’s Day and…something unexpected managed to leap up out of the search results. 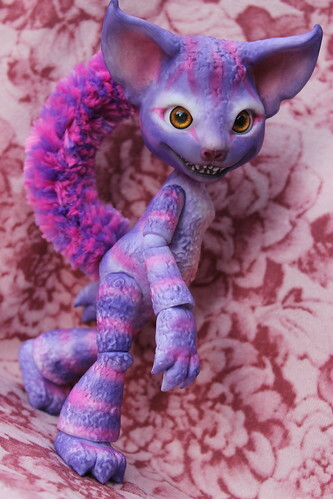 I pounced on the order button immediately, I went for the custom color option as I personally fail at all things art and requested the iconic pink/purple Cheshire Cat coloring. He arrived yesterday and words can not adequately describe how much I love and adore him. 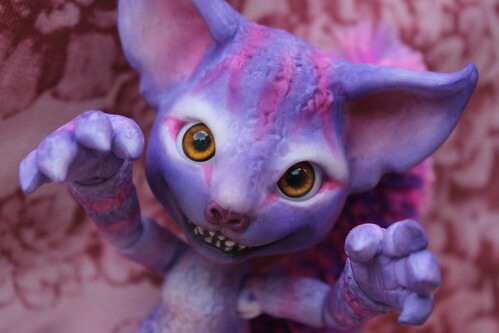 I think he may just be my new favorite bjd! So far I have just been referring to him as Grin as it just seems to suit him so well but I may settle on a new name eventually. I think the thing that attracts me to him the most is how much personality he seems to have, he has so much character and is so very unique; I’ve never handled another doll quite like him before. 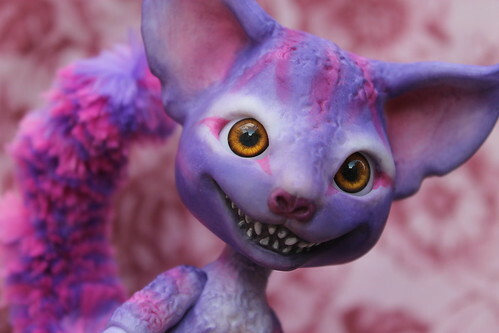 I love how he is adorable but also a bit creepy at the same time (his faceplate can detach). 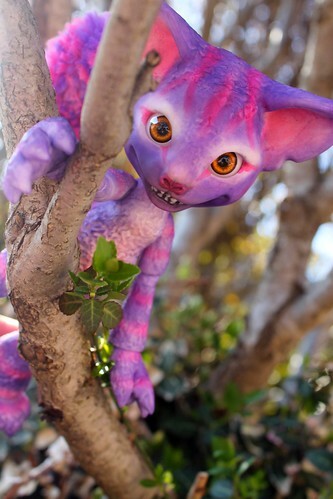 I will admit he was actually a bit larger than I had anticipated, he is about nine inches tall once the cat ears are factored in I had mistakenly thought he was going to be approximately Lati Yellow/Pukifee sized (silly me didn’t think out the math). Despite the fact that he is a bit larger than I had expected, he is the perfect size to fit in with the rest of my Alice crew so I am quite happy. I was really impressed with how well he poses. Photographing him has been an absolute pleasure for me, I had so much fun photographing him yesterday I took outside for some additional photos today. I may even bring him along to Anime Boston with me this weekend. 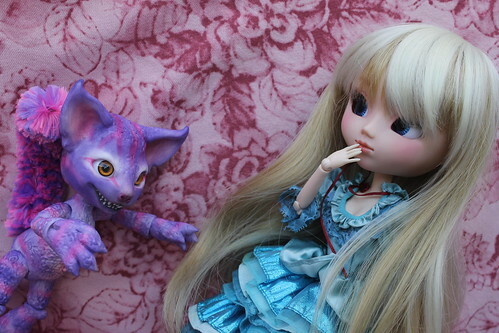 I took a couple of pictures of him yesterday with my other new arrival a somewhat Alice-y looking custom Pullip who I named Miyuki (ie. 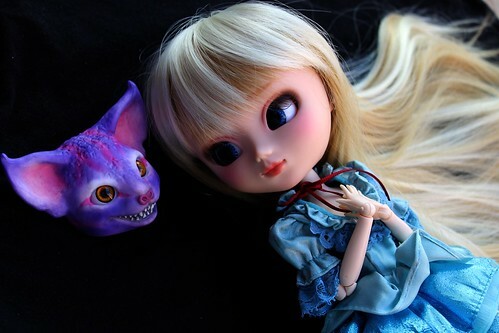 Miyuki-chan in Wonderland). He looks a bit menacing here! 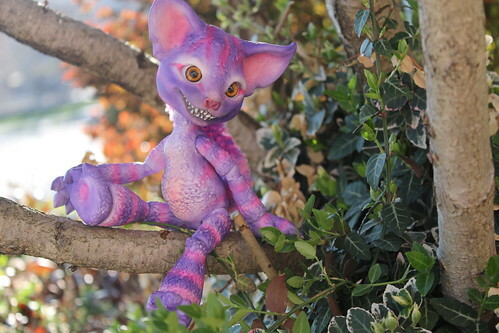 I had tried to take pictures of him with my Dormouse (Dollfactory Bobo the 3rd) but unfortunately none of them really came out how I wanted them too (it looked like Grin was getting ready to maul the poor thing). I did mention that his faceplate was removable right? I can’t get over just how much I love him, maybe it was because this is my first bjd not bought from a major company but rather the artist herself. He just seems so much more personal to me than my other bjds. I can’t speak highly of his creator Sarah Seiter enough as I am just incredibly pleased. Believe it or not there are yet more pictures of him on my flickr. 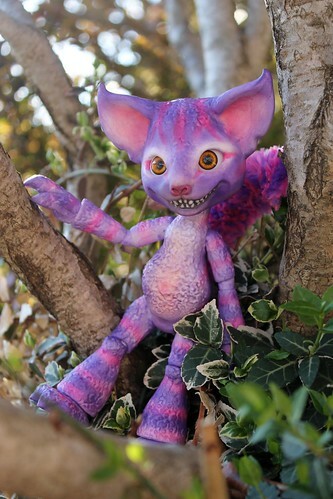 This entry was posted in BJD, Doll and tagged alice in wonderland, anthro bjd, BJD, cheshire cat, grin the cheshire cat, mushroompeddler. Bookmark the permalink. His little teeth are just the cutest thing. 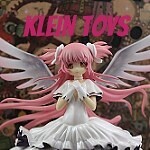 There are dolls a little like doll factory animal dolls but cheaper called pang-ju. You can find them on pullip style 🙂 . Oh and I love your blog!